This is an NFR book - a 'not Fulham related' book. Actually that's not quite right as it has been written by an avid and well-known Fulham supporter, who contributes to the fans' magazine TOOFIF and to the website Fulham Focus. 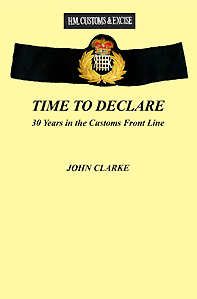 The content of the book, however, is about John's years as a customs officer. The book describes his nabbing of many a smuggler, and is full of wit, wisdom and humour. Not to be missed! The book is a paperback of 144 pages with illustrations and is produced with usual Ashwater quality. John has priced the book at a bargain £7.95 with just £2 extra for posting. To obtain a copy please use this drop-down menu where you can pay via PayPal. Copies will be despatched by the author, not Ashwater. PLEASE NOTE: The book is currently at the printers and is due to be available from May 8th. Copies will be posted after that date. Thanks from John and Ashwater.